The storage pond for the original water source of the waterwheel was built at the back of Smithy Hill. It was semi-elliptical in shape, with the hillside serving as the back wall, and the sides and front built up with stone. 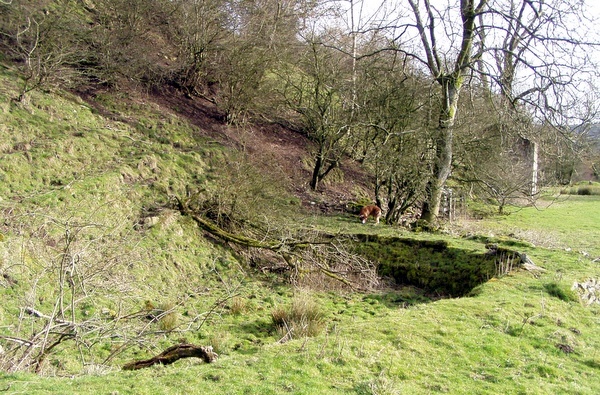 The pond was fed from a leat contouring round the hillside from the north, and from a contemporary map it seems that the outlet was on the southwest corner, but there is no sign of it now. It was about 10 m by 8 m by a metre deep, and so probably had a capacity of about 70 cu m. This photograph was taken in 2004. Click the image to see a larger version.